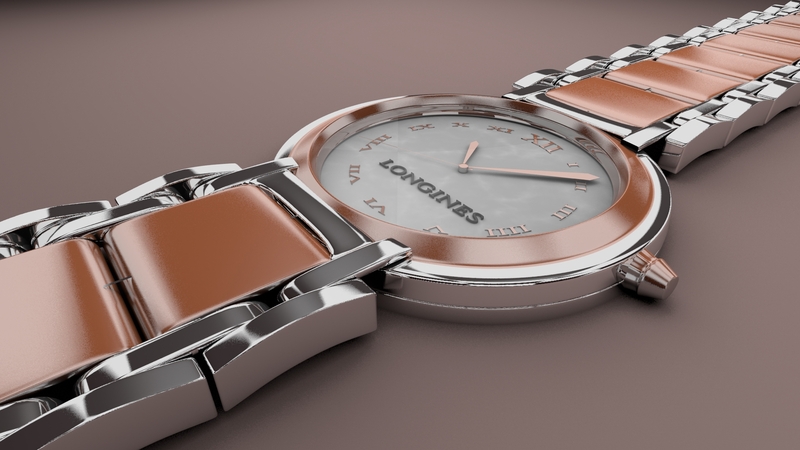 Home » Graphic Tools , Tutorials » Creating a Fancy Watch in Blender, Chapter VI. Take the selected face and bring it down on the Z-axis slightly. Add loop cuts to sharpen the edges of the mesh. Add an array modifier and change the count to 7. Change the relative offset “X” value to 0 but change the Y to -1.03 so that there is a space between each array count. Now we need to mirror the entire watch band to the other side of the watch. For each part of the watch band, add a mirror modifier, uncheck “X.” and check “Y.” Then make sure you mirror each part of the watch band to the watch itself (The default name should be just “Cylinder”). Now add the floor. Simply add a plane and make sure that the bottom of the watch just touches the plane. Make the plane pretty large as well. Also move the camera to a more appropriate view. I found that a focal length of 25 and a camera placement similar to what you see works well. Obviously the words “Text” are no good. Press Tab to go into edit mode and start typing some actual words for the clock. You can type Roman numerals or plain old letters. I chose (for some variety) to use Roman numerals. After each number, press Spacebar three times to get some space between each number. In the Font options, change the “Regular” font type to “Times New Roman.” (You can find your fonts at C:/Windows/Fonts – it may be different for different computers) Also set the Extrude amount to 0.004. Now we need to curve the text on a Curve Circle. Add a Bezier Circle and add a Curve modifier to your text. Once you set the “CurveCircle” to be the target for the curve, the text is warped around the curve. Scale the text down until it looks the way it should. By grabbing and scaling, fit the bezier circle and the text to fit appropriately in the watch face. Now we need to create the watch hands. Start off by adding a cylinder for the watch hands to sit on. Scale it down appropriately. Shade the cylinder smooth and add an “Edge Split” modifier.